A week or so ago, I was trying desperately to come up with as many interesting and different flavour combinations for lamingtons as I possibly could. Possibly, the time would have been better spent doing the ironing or going to the dry cleaners, but since you only really ever get to set yourself a 10-day lamington challenge once in your life, I figured I'd indulge myself while I had the chance. And then I had an email from my cousin Ally, who has been working for a German firm in Munich since September. She said she loves reading Delicious Delicious Delicious (which made me blush), and also, would I please consider posting the recipe for Snickerdoodles, because she remembers us making and eating them when we were kids (and I will do that soon, Ally, I promise - after the lamingtons!). And that's when it hit me: Snickerdoodle lamingtons! Martha Stewart made Snickerdoodle cupcakes (I have taken the decision always to capitalise the word 'Snickerdoodles'), and I remember thinking that they were about as far from exciting as you could get - just cinnamon sugar dusted sponge. But Snickerdoodles, like lamingtons, are rolled and coated; they are like cousins. And how appropriate! The white chocolate ganache (if I can call it that!) on these keeps everything creamy and moist, but I decided to get a bit more spicy than is traditional with actual Snickerdoodles. 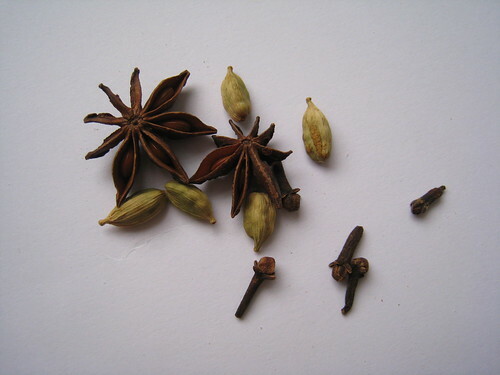 These contain cardamom, cloves and cinnamon, but the star anise you see in the photos is just meaningless food styling. 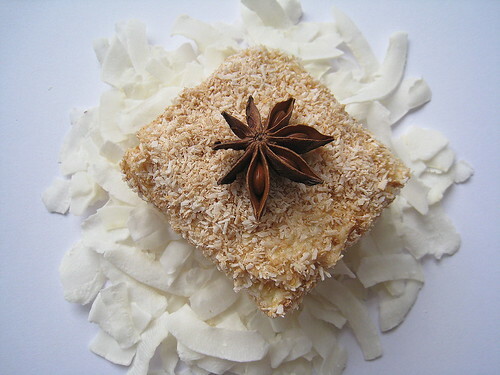 Anise lamingtons? Ich denke nicht! Slice the cake as needed, and brush off any crumbs. Melt together the chocolate and cream, then cool slightly. Mix the spices and coconut in a shallow dish. Dip the cake first into the chocolate mixture, and allow excess to drip off before rolling in the spiced coconut. Set aside to dry on a wire rack for a few hours before eating. Aw, so warm and ...well, spicy looking! I like these so much - you should line these up when you're done (the photos) to see the spectrum of colors! Oh Pete I feel famous! Well done for your baking brilliance. Mum is coming over this weekend (sadly without Glyn), but maybe we can have a bake off if time allows it?! Ms. Humble - You haven't seen them all yet! Oh...singing and dancing and oohing and aahing....I'm loving Lamingtons more and more by the day! Another fab idea - this is so much fun!